Andrew and I met early in our first year of medical school. After a couple years of dating, Andrew proposed at the only remaining covered bridge in South Carolina. While neither of us are South Carolina natives, it was the state we had lived in, explored, and fell in love with during our time together, so it was only fitting to get married there! My Mikaella dress was definitely not the first dress I tried on during a long weekend of wedding dress shopping. However, when I did finally try on my dress, I burst into tears and knew immediately it was the dress I would wear walking down the aisle. On our wedding day, we were surrounded by our family and friends, many of whom had traveled from out of state to celebrate our day with us, and it was a perfect 75 degree spring day. 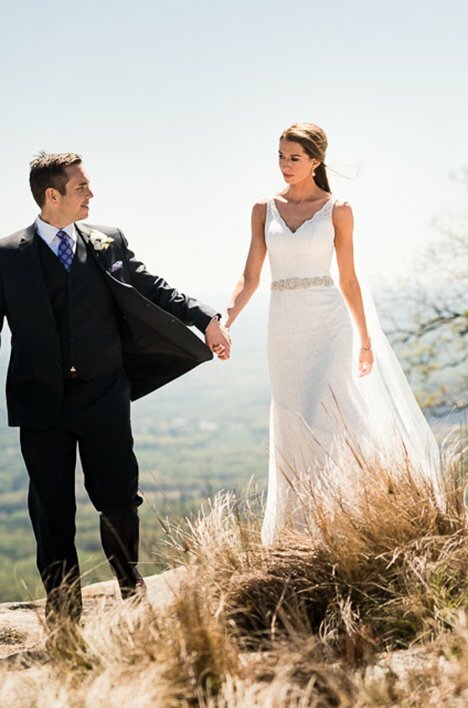 Our ceremony was at the Cliffs at Glassy Chapel; a chapel high up in the mountains of upstate South Carolina. For our reception, we returned to downtown Greenville to celebrate at the Huguenot Mill Loft overlooking the gorgeous Reedy River.